We live in the Midwest and the nearby town really likes Christmas. Each year the celebration gets bigger and bigger, and the local paper runs a "Letters to Santa" section. But it's not just a page or two.. it's 8 pages long! And with that much data, I thought it'd be interesting to see what young children are telling Santa Claus are their most desired things. We proceeded to read through all the letters, and record any requests mentioned. I assume the letters were hand-written and sent to the paper, which were then typed for the paper. Whatever happened resulted in a lot of gibberish words that are weird even for young children. But for the requests that we could read, we've recorded those. 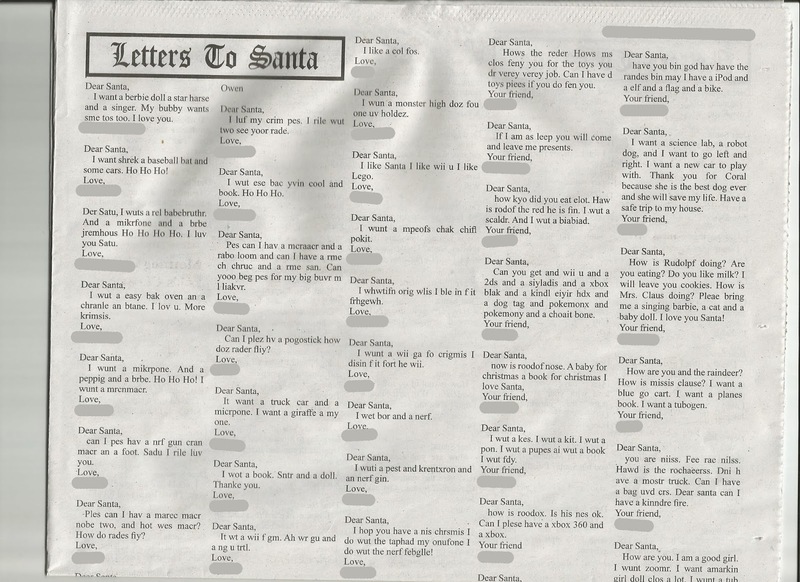 Scan of some of the letters to Santa. And here's a graph of the results. I've highlighted the video game related items, but you can zoom in to the picture and see all the requests. There were a total of 278 letters with 398 requests. There was a lot of inquiry into how Santa is feeling, how is Mrs. Claus, and what are the elves doing. "How do the elves make all those toys?" I think this is nice as it shows some critical thinking and curiosity into how this magical thing can really occur. The fun part of numbers like these is trying to sort out what they could mean on a broader scale. If we compare all touch-screen system requests (56) to all traditional game consoles/handhelds (50), it's actually pretty close. These are young kids who probably already play a lot of tablets or hear about them, but it's interesting to see that traditional game consoles held their own. Video Game related requests account for almost 40% of what kids wanted this Christmas! That seems like a lot! Does it mean kids aren't going outside anymore, or drawing, or playing tag? Not really--going outside is (thankfully) still free. They don't have to put it on a list to Santa. They already have it. Paper, pencils... those are cheap as well. So are most books. Most kids probably have plenty of paper on which to draw, and books to read, and outdoors to explore. It's important to consider that a request to Santa Claus doesn't necessarily mean that the request is a child's favorite thing. The request is probably, mostly about being a thing *they don't have*, which means it's probably missing currently because it's expensive. Video Games (especially systems) are expensive. In general this bodes well for the industry, showing that as a whole, Video Game related products are some of the most requested things. 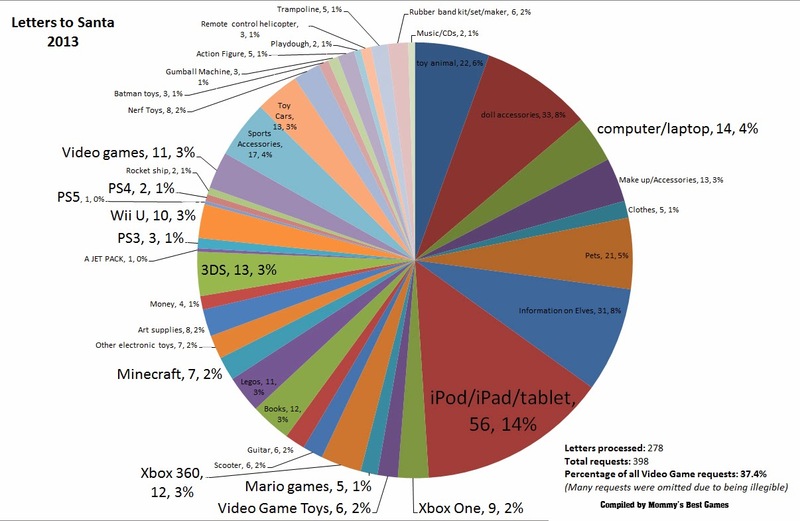 Tablets and touch screens were the single biggest category, and are clearly in the minds of very young children. But it's also impressive that, despite all the naysaying in the press recently, Nintendo beat out Microsoft and Sony among the young children. Do you notice any other important trends or fun details?